Lisa Justine Hood as, um, the balcony, Ben Van Osch as Juliet and Shawn Van Osch as Romeo. Photo courtesy of Devin Sturgeon. 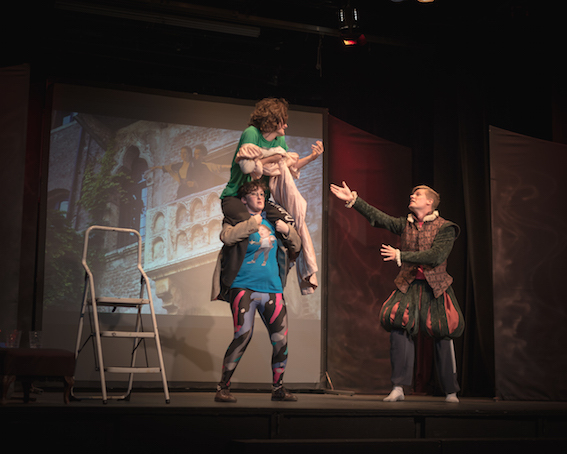 GODERICH – If you’re looking for high-brow culture in summer theatre, then The Livery Theatre is probably not where you want to be. 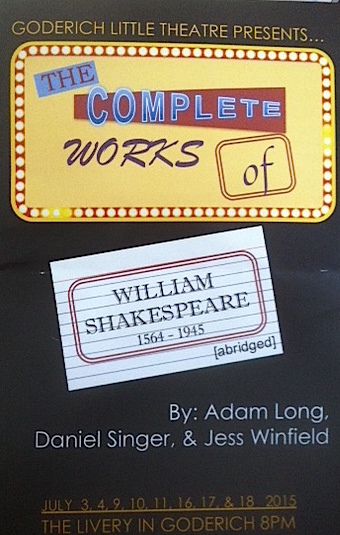 On the other hand, if you’re looking for some well-over-the-top rollicking fun, then this is precisely the place to be, in order to catch a showing of The Complete Works of William Shakespeare (abridged), directed by David Armour. Relying on a script that gives the impression of being written by a pre-pubescent male for all its cheap sexual innuendos, cross-dressing and fixation on bodily functions (specifically, puking), the trio of actors – Lisa Justine Hood, Shawn Van Osch and Ben Van Osch – take to the stage with all the gusto of neighbourhood kids playing make-belief long into a summer’s evening. I’ll tell you straight out that this play is uproariously funny if, and only if, you give in to its persistent silliness. It might seem a little weird that Ben Van Osch really relishes his roles as Ophelia and Juliet, with massive wigs and long dresses, but then again, there was a time when women’s parts were exclusively played by men. And this is the season of community reunions where more than a few men will inevitably dress in skimpy women’s lingerie and plaster on makeup for shirt-tail parades. So best to just roll with it. When you accept that its entirely appropriate for Ken and Barbie dolls, an inflatable dinosaur, a few lines from The Time Warp, and the Van Osch brothers’ mother to be woven into the production, then you’ll have a grand time. In this play, the 37 or so tragedies, comedies and histories spun out during Shakespeare’s prolific career are turned into a series of quickies strung together over two hours. They are irreverent, raunchy and sometimes swollen with bad puns. Oh yeah, and definitely not appropriate for a young audience. Last night, it was a very friendly audience. Perhaps a quarter of the people were related to the Van Osch brothers, and a number of producers and directors from other plays staged at The Livery were there. You can still catch a performance of this play on July 16, 17 or 18, starting at 8 p.m. Tickets are available online or by calling 519-524-6262 on Thursday or Friday, from 3 p.m. to 5 p.m. Tickets are $25 (adults), $22.50 (seniors) or $15 (youth). Livery Members: $20 (adults), $18 (seniors) or $15 (youth). Seating is by general admission.